TICKET sales for The Enchanted Forest, a Perthshire Big Tree Country event, have broken all previous box office records, welcoming over 24,000 visitors during its 23-night run. The news comes as the event enters its final week and celebrates the announcements that is has been shortlisted for two further awards. The Highland Perthshire Area Community Interest Company, which has successfully run the show since 2010, has been shortlisted for the Community Award in this year’s Perthshire Big Tree Country Awards, the results of which are due to be announced this Sunday. The Enchanted Forest has also been shortlisted for Event of the Year at this year’s Perthshire Chamber of Commerce Business Star Awards, however the team will need to wait until Friday 25th November to learn their fate. Eddie Thomson, chair of the Highland Perthshire Area Community Interest Company, commented: “This year has seen unprecedented demand for the event and the box office has been working around the clock to ensure everyone gets their tickets. The latest figures put the event well ahead of the record breaking 20,000 tickets sold in 2010. The year’s theme, Transitions, was designed by Simon Wilkinson and RJ McConnell, the design team behind the multi-award winning 2010 show. This year’s show has provento be exceptionally popular with visitors, with many claiming it is the best show yet. Tricia Fox, marketing manager for The Enchanted Forest, said: “We are extremely pleased with the performance of this year’s show – there’s a lot of hard work and planning goes into a show of this scale and it’s rewarding that demand is increasing, year-on-year. 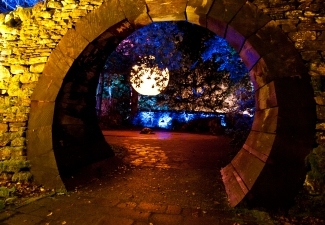 For further information about the Enchanted Forest and to purchase tickets, visit the Enchanted Forest website at www.enchantedforest.org.uk. The show closes to the public on Saturday 29th October. Ticket sales for The Enchanted Forest, a Perthshire Big Tree Country event, have broken all previous box office records, welcoming over 24,000 visitors during its 23 night run. The Highland Perthshire Area Community Interest Company which has successfully run the show since 2010, has been shortlisted for the Community Award in this year’s Perthshire Big Tree Country Awards, the results of which are due to be announced this Sunday. The latest figures put the event well ahead of the record breaking 20,000 tickets sold in 2010. The year’s theme, Transitions, was designed by Simon Wilkinson and RJ McConnell, the design team behind the multi-award winning 2010 show. This year’s show has proven to be exceptionally popular with visitors, with many claiming it is the best show yet. For further information about the Enchanted Forest and to purchase tickets, visit the Enchanted Forest website at www.enchantedforest.org.uk. The show closes to the public on Saturday 29th October.